The 2016 NCAA men’s basketball tournament field of 68 was announced Sunday evening. 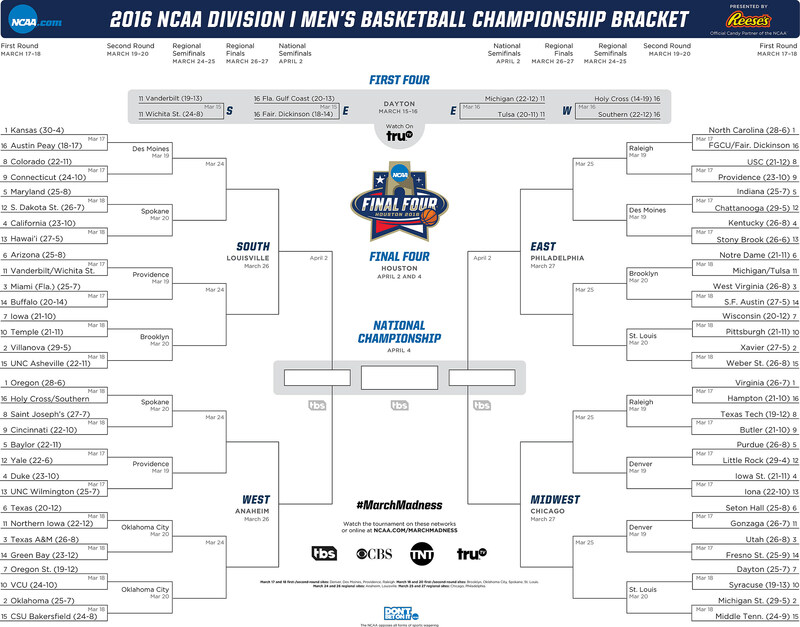 While college students around the country rejoiced and planned epic road trips to see their teams in action, you may have been gripped by anxiety: your 2016 NCAA Tournament bracket for your office pool is due soon. Click image for a printable bracket. You need to relax. The only person who has to worry is your boss: office productivity is about to suffer a crushing first-round loss on Monday. Besides, even the sharpest college hoops pundits agree that this has been an extremely unpredictable season: nearly any team in the field could make it to the Final Four in Houston on April 2-4. We’ve put together a region-by-region guide of what you need to know to help you fill out your NCAA Tournament brackets. Just don’t show your boss, unless you want to split your winnings. Kansas (30-4) puts the chalk in ‘Rock Chalk, Jayhawk.’ The deep and talented Jayhawks haven't lost since January 30. They wrapped up their 12th straight Big 12 title on Saturday. If forward Perry Ellis and guard Devonte' Graham don’t make it to Houston, it will be shocking. Whether they can win it all depends on if this team has already peaked. After enduring the Big 10 schedule, Maryland (25-8) won’t fear any team in its path. The Terps can match talent with just about anyone in the South Region, including Kansas. They’ll need to win twice to face the Jayahwks, though. If guard Melo Trimble gets hot, anything is possible. Seniors Fred VanVleet and Ron Baker already have plenty of NCAA tourney wins and a Final Four appearance at Wichita State (24-8). More could be on the way. The Shockers must get through a tough Vanderbilt team in the First Four, but they can certainly challenge Arizona, Miami and other higher seeds if they march through the Commodores. Good news: For the third consecutive year, Villanova (29-5) finds itself as one of the top two seeds of a region. Bad news: The Wildcats lost in the second round the past two years. Head coach Jay Wright’s team is at risk of becoming a poster child for disappointing NCAA tournaments. After all, “the best predictor of future behavior is relevant past behavior.” No way is Dr. Phil picking the ‘Cats. Maybe if he knew about junior guard Josh Hart? Many college hoops fans may not know about the amazing athleticism of California’s freshman forward duo of Ivan Rabb and Jaylen Brown. They combine for more than 27 points and 14 rebounds per game, and they play well above the rim. This pair of Golden Bears could find their way to the NBA sooner than later. Now, now, now: Bill Self is not in danger of losing his job at Kansas no matter what his team does in the 2016 NCAA Tournament. However, it would be considered disappointing for a program that’s made an NCAA record-tying 27 consecutive tournaments to have just two Final Four appearances during Self’s 13 seasons. No team — including No. 1 overall seed Kansas — has played as well through its conference tournament as top-seeded North Carolina (28-6). If guard Marcus Paige finds his 2014-2015 groove, and the Tar Heels defense is as good as it was in the ACC tourney, Roy Williams’ team should make it to Houston. Even if Paige is off, Brice Johnson, Joel Berry and Justin Jackson are all serious offensive threats that should keep them dancing for weeks in Chapel Hill. Kentucky (26-8) loses a lineup of players to the NBA and doesn’t head into the tournament undefeated, so it’s no longer afforded “favorite” status. Wow. Head coach John Calipari might be able to coach his kids with big blue chips on their shoulders. Guards Tyler Ulis and Jamal Murray can take over any game against any team. The Wildcats were good enough to win the SEC tournament, and they played Kansas very tough in late January. Guard Kris Dunn and forward Ben Bentil make ninth-seeded Providence (23-10) a team no one wants to face. The Friars should get past USC in the first round, setting up a clash with the Tar Heels in Raleigh. N.C. State fans might want to start sizing up those monk robes now. Second-seed Xavier (27-5) made the Sweet 16 a year ago and has spent much of 2016 in the top 10. Head coach Chris Mack’s team gets great guard play and rebounding, so what’s not to love? Well, a strength-of-schedule of 49, which is second-worst of the top eight seeds (Michigan State, 79). The Musketeers could make a run to the Elite Eight, but they could also fall to the winner of the Pitt-Wisconsin game in the second round. Stony Brook (26-6) will make its first NCAA tournament appearance, because senior forward Jameel Warney willed them there with a 43-point effort in the America East Conference title game. He averages 19 points and 10.7 rebounds, while shooting a scalding 62.6 percent from the field. Between Warney and mascot Wolfie Seawolf, Stony Brook makes every game entertaining. Big Ten regular season champs Indiana (25-7) recovered nicely after losing three of five games early in the season. Even that early, head coach Tom Crean started to hear detractors. He’ll hear them again if his fifth-seeded Hoosiers exit the NCAA tournament as quickly as they did in their conference tourney. Never pick against head coach Tom Izzo. Michigan State (29-5) has a great offensive team and player-of-the-year candidate Denzel Valentine, who nearly averaged a triple-double (19.6 points, 7.5 assists and 7.6 rebounds) this season. No, the Spartans haven’t played a killer schedule, but they were good enough to beat Kansas back in November. It’s not hard to imagine them meeting the Jayhawks again in Houston on Monday, April 4. Iowa State (21-11) isn’t as highly regarded as they were heading into last year’s tournament — when they lost in the first round to UAB. With the pressure off, forward Georges Niang and guard Monte Morris can engineer a deep run by beating Purdue and Virginia. The Cyclones have to beat Iona first, though. Guard Isaiah Whitehead has become a budding star at the right time for Seton Hall (25-8) and head coach Kevin Willard. The Pirates stifling defense can stop any team, including Gonzaga (11), Utah (3) and maybe even Michigan State (2). Virginia (26-7) plays great defense; is led by superstar guard Malcolm Brogdon; and coached by the sharp mind of Tony Bennett. So, why won’t the Cavaliers make the Final Four? Well, their methodical pace sometimes lets lesser teams stick around too long. In March, that can come back to haunt you, especially against a team like Tubby Smith’s Texas Tech or Butler. You’ve been warned. You’ll be hearing about Jakob Poeltl in an NBA Draft preview soon enough. For now, all you need to know is that the seven-foot Utah center can be unstoppable. He averages 17.8 points 9.1 rebounds and 1.6 blocks per game. He may not be dominant enough to get the Utes (26-8) to Houston, but he can certainly make the first two rounds — or more — interesting. Syracuse (19-13) probably didn’t deserve an NCAA Tournament bid this season, but the selection committee felt otherwise, gifting iconic head coach Jim Boeheim and his team a slot as a 10-seed against seventh-seeded Dayton. Maybe that was their way of punishing them? The Orange lost to the Flyers in the second round of the 2014 NCAA Tournament, Syracuse’s last foray into March Madness. Either way, a quick, embarrassing loss might mean that the calls for Boeheim to retire will grow louder. Oklahoma (25-7) has player-of-the-year candidate Buddy Hield and his experienced supporting cast (Jordan Woodard, Ryan Spangler and Isaiah Cousins). The Sooners were just 6-5 over their last 11 games, but they were 12-0 against non-conference opponents this season. This is the type of veteran team that can saw through its region and find itself facing Kansas in the Final Four. Can the defending national champions be a dark horse team? Yes, especially after losing three players (Jahlil Okafor, Tyus Jones and Justise Winslow) to the NBA and forward Amile Jefferson to a season-ending foot injury. Duke (23-10) has been inconsistent this season, and they aren’t very deep. However, Grayson Allen, Brandon Ingram and Matt Jones have spent all season beating teams like North Carolina, Virginia and Indiana. They also gave Kentucky and Utah all they could handle. The talented combo of DeAndre Bembry and Isaiah Miles leads Saint Joseph’s (27-7) into a challenging bracket that includes Cincinnati and Oregon. The Hawks flapped their way this far by playing smart basketball. That type of approach nearly always works well in March. Texas (20-12) uses the same high-pressure defense that head coach Shaka Smart employed at VCU. It got the Longhorns to the NCAA Tournament, but it could backfire against patient Northern Iowa (11). It surely won’t phase a third-seeded Texas A&M team that took Kentucky to overtime twice this season. Despite a Pac-12 title and a No. 1 seed, Oregon (28-6) might still be underrated. That’s definitely true for Chris Boucher, the team’s 6-10 forward. Still learning the game, Boucher won’t make jaws drop with smooth post play, but he will get to practically every rebound and challenge shot after shot in the lane. Yes, head coach Scott Drew was the man responsible for resuscitating the men’s basketball program at Baylor (22-11). However, another early round NCAA exit could get boosters asking if he’s the guy who can ever get the Bears to their first Final Four since 1950. It’s the harsh reality of the what-have-you-done-for-me-lately world of college sports.